Catalysis by solid bases and related subjects (K. Tanabe). A TDP, FT-IR and catalytic study on the interaction of methanol with pure and KOH doped TiO2 anatase (G. Busca et al.). Acid and base strength of alumina-magnesia mixed oxides (J.A. Lercher et al.). Influence of the operating conditions on the morphology and acidity of K2CO3/&ggr;Al2O3 (X. Montagne et al.). Acidic reactions on some transition metal oxide systems (B. Grzybowska-Swierkosz). Modification of the acidity and basicity of the surface oxide catalysts (S. Malinowski). Basic molecular sieve catalysts/side-chain alkylation of toluene by methanol (J.M. Garces et al.). Importance of the acid strength in heterogeneous catalysis (D. Barthomeuf). Structure and acidic properties of high silica faujasites (F. Maugé et al.). Acidity in zeolites (A.G. Ashton et al.). Acidic and basic properties of aluminas in relation to their properties as catalysts and supports (H. Knözinger). Reactivity of isopropanol on K- and Cs-exchanged ZSM-5 and mordenite (J.B. Nagy et al.). Quantitation and modification of catalytic sites in ZSM-5 (E.G. Derouane et al.). Characterization of acidic properties of heteropoly compounds in relation to heterogeneous catalysis (M. Misono). Heteropoly compounds: solid acids with guarded protons (J.B. Moffat). Heteropolyacids as solid-acid catalysts (Y. Ono et al.). New covalent boron (III)-molybdenum (VI) mixed oxo model compounds as eligible hetero bimetallic catalysts for propylene epoxidation (E. Tempesti et al.). Catalytic activities and selectivities of crystalline &egr;-Zr(HPO4)2 (K. Segawa et al.). Calorimetric study of adsorption of ammonia at 420 K on bismuth molybdate (2:1) (L. Stradella). Skeletal isomerization of n-butene over modified boron phosphate (B.P. Nilsen et al.). Catalytic application of hydrophobic properties of high-silica zeolites. II. Esterification of acetic acid with butanols (S. Namba et al.). The mechanism of n-pentane transformation over solid superacids Al2O3/AlCl3 (M. Marczewski). Factors affecting the deactivation of zeolites by coking (E.G. Derouane). Valorisation des oléfines: oligomérisation catalysée par le trifluorure de bore (C. Marty, Ph. Engelhard). Upgrading of C4 cracking cuts with acid catalysts (B. Juguin et al.). Hydrocracking of n-heptane on Pt-HZSM-5. Effect of calcination and reduction conditions (G. Giannetto et al.). Transition ions exchanged zeolites as cracking catalysts (D. Cornet, A. Chambellan). Characterization of acid catalysts by use of model reactions (M. Guisnet). Application de la résonance magnétique nucléaire a l'étude de la distribution et de l'acidité de l'eau de constitution des solides (C. Doremieux-Morin, J. Fraissard). Microcalorimetric characterization of acidity and basicity of various metallic oxides (A. Auroux, J.C. Vedrine). Determination de l'acidité de catalyseurs solides en milieu aqueux à l'aide d'un marquer cinétique (R. Durand et al.). Degradation mechanism of 3-methyl-pentane on a supported superacid catalyst studied by the 13C isotopic tracer technique (F. Le Normand, F. Fajula). Relationship between catalytic activity and acid strength of LaHY zeolites in cumene cracking and o-xylene isomerization (She Li-Qin et al.). Acid properties of a bidimensional zeolite (D. Plee et al.). Thermal stability and acidity of Al3+ cross linked smectites (D. Tichit et al.). Mechanisms of the acid-catalyzed isomerization of paraffins (F. Fajula). 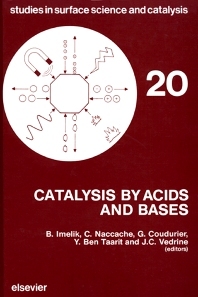 Acidic catalysis and radical assistance (D. Brunel et al.). Alkylation of benzene with propene on benzyl sulfonic acid siloxane catalysts (A. Saus et al.). The conversion of dimethylether over Pt/H-ZSM5. A bifunctional catalyzed reaction (C.W.R. Engelen et al.). Acid-catalyzed conversion of n-decane over high-silica faujastites (P.A. Jacobs et al.). A new approach to the cracking of alkanes as a test reaction for solid acid catalysts (A. Corma, V. Fornés). Comparison of the reactions of ethylcyclohexane and 2-methylheptane on Pd/LaY zeolite (J. Weitkamp, S. Ernst). Primary cracking modes of long chain paraffinic hydrocarbons in open acid zeolites (J.A. Martens et al.). Catalyseurs isolants et acidité - les acides paradoxaux (Y. Trambouze). Because of the great importance of acid catalysis in the petrochemical industry, extensive research has been carried out during the last 30 years concerning the fundamental and applied aspects of catalysis by acids. In contrast, base-catalyzed reactions have received little attention in heterogeneous catalysis. The aim of this symposium was to evaluate our knowledge of the important area of acid and base catalysis and to cover a broad range of solids, zeolite chemistry being only one aspect of heterogeneous catalysis.